July 17, 2017 5:00 P.M.
Also present were Rich Simon – Director of Public Works, Dustin Bedore – Director of Electric Utilities, Joni Showalter-Police Chief, Suzanne McClure – Economic Development Director, Brian James – Fire Chief, LeAnn Taylor – Municipal Court Judge, Jake Kling – City Attorney, Mary Volk – City Clerk, and Andrew Finzen – City Manager. Home Occupancy Permit – Rochelle Kling – Mayor Linin opened public hearing at 5:00 p.m. There was no public comment so Mayor Linin closed public hearing at 5:01 p.m. Ordinance 1706: STO 2017 – LeAnn reviewed changes in STO for 2017. Andrew stated, annual changes from Legislature are updated in STO, then the City adopts STO annually. ON A MOTION by Commissioner Mai to approve Ordinance 1706: STO 2017 seconded by Vice-Mayor Fairbanks. MOTION carried on a VOTE of 4-0. Ordinance 1707: UPOC 2017 – LeAnn reviewed changes in UPOC for 2017. ON A MOTION by Commissioner Mai to approve Ordinance 1706: UPOC 2017 seconded by Commissioner Farris. MOTION carried on a VOTE of 4-0. Resolution 1510: Unfit Structure 1601 Kansas Avenue – Andrew stated, the property owner for 1601 Kansas Avenue asked City to condemn property. They understand the process for unfit structures and this is in fact an unfit structure. I explained we have a priority for the structures so we need to look at the danger the structure is to community and funding availability. The owner indicates if we proceed with process on property, they have a group to demolish property at no cost to City. If the City goes through process and something changes that they do not demolish property, the City can drop process and pick property up later. Resolution sets public hearing date. Vice-Mayor Fairbanks asked, what is benefit to declare unfit if they have the ability to demolish property? Andrew stated, they indicated it relates to their Social Security or Disability benefits which are not our concern; however, if we can remove an unfit structure at no cost to City, I believe we should go that direction. Mayor Linin asked, do they have plans for property? Andrew stated, I do not believe they have plans for property. We will have owners at hearing to discuss property and answer questions. ON A MOTION by Vice-Mayor Fairbanks to approve Resolution 1510: Unfit Structure 1601 Kansas Avenue seconded by Commissioner Mai. MOTION carried on a VOTE of 4-0. Cemetery Board: Mitch Tiede – Andrew stated, there is a vacancy on the Cemetery Board and Mitch Tiede has submitted an application to serve a three year appointment. ON A MOTION by Commissioner Mai to appoint Mitch Tiede to the Cemetery Board for a three year term seconded by Commissioner Farris. MOTION carried on a VOTE of 4-0. Home Occupation Permit: Rochelle Kling – ON A MOTION by Commissioner Farris to approve Home Occupation Permit for Rochelle Kling seconded by Vice-Mayor Fairbanks. MOTION carried on a VOTE of 4-0. Arts Center Use of Chambers Park – Abby Killingsworth, Arts Center Director stated, we are planning an art walk September 9th and would like to request the use of Chambers Park pavilion for sidewalk chalk contest. We submitted a street closure request for Main Street from 10th to 11th Streets for art walk. ON A MOTION by Commissioner Mai to authorize use of Chambers Park pavilion for sidewalk chalk contest and Main Street from 10th to 11th Streets for the Art Walk seconded by Vice-Mayor Fairbanks. MOTION carried on a VOTE of 4-0. Cereal Malt Beverage License: Sunset Bar & Grill – Andrew stated, the owner of Sunset Bar & Grill is present. Joni and Brian have done inspection and walk through on property, and recommend approval. License will be in effect until year end. ON A MOTION by Vice-Mayor Fairbanks to approve Cereal Malt Beverage License for Sunset Bar & Grill seconded by Commissioner Mai. MOTION carried on a VOTE of 4-0. Unfit Structure: 1008 Main – Andrew stated, Resolution 1509, previously approved for this property was sent to property owner and they received by certified mail. We have been unable to make contact with property owner. 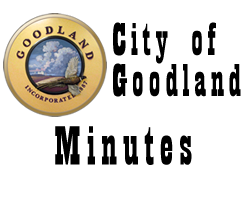 On the recommendation of EBH we have contacted a structural engineer from Hutchinson that is scheduled to be in Goodland August 2nd to give recommendations. I recommend the Commission table action on property until August 21st for the Commission to be able to review the report. The property was posted with notice that it is unsafe to enter property. Over the weekend I received information that people were moving stuff out. I looked at property Sunday and saw no activity. When I looked at property today the City locks have been removed along with the notices. The door is now secured with a coax cable. I am concerned the property owner cleaned out what they wanted and left town. We are discussing ways to address property but feel Commission should not act until receive report from engineer. ON A MOTION by Vice-Mayor Fairbanks to table action on 1008 Main until August 21st meeting seconded by Commissioner Mai. MOTION carried on a VOTE of 4-0. Unfit Structure: 602 Clark – Andrew stated, property owner has been working with City. They are on waiting list of roofing contractor but cannot proceed. We believe roof will be complete soon so feel Commission should table property meeting to meeting until we can remove property from nuisance list. ON A MOTION by Commissioner Mai to table action of 602 Clark until August 7th meeting seconded by Commissioner Farris. MOTION carried on a VOTE of 4-0. Unfit Structure: 811 E. Hwy 24 – Andrew stated, we received lab results on property. There is asbestos in some flooring, window caulking, ceiling texture and pipe wrap. EBH is compiling report for Commission to review at August 7th What we do to this property is tied to 1008 Main so Commission needs to base decision based on both properties. I recommend table action on 811 E. Hwy 24 until August 21st meeting. ON A MOTION by Commissioner Mai to table action of property until August 21st meeting seconded by Commissioner Farris. MOTION carried on a VOTE of 4-0. City Managers Report- 1. We have had no correspondence with property owner at 1619 Kansas so the property will be on the August 7th 2. With the recent budget process I would like to discuss ways to improve process. I would like to start process earlier next year. When the reports are distributed to the department heads, I would like to have input from Commission on the budget, especially the project development fund. I also feel the Commission should consider morning meetings with department heads to discuss budgets and keep pace. That would allow the Commission time to think about the meeting and have a final discussion later to make decisions. I welcome the Commission input on process. Mayor Linin stated, I like Andrews thinking on budget and I know Commissioner Garcia has discussed going back to that process. I feel we need more time for Commission to understand budget. Vice-Mayor Fairbanks stated, when we did this process in past, it was a week long process which was the reason process got streamlined. I would like to find a happy medium as it would be nice to have some of information ahead of time. Commissioner Mai stated, I enjoyed the power point. 3. Brick Street project is complete, waiting on KDOT walk through. Mayor Linin stated, it is nice to have street open. Vice-Mayor Fairbanks stated, I am thankful businesses on block were able to deal with construction. 4. Working to schedule joint meeting with City, School and County to discuss NRP and other items County would like to discuss. If Commission has items want on agenda please let me know. 5. We will have an inspector for pool slides here Tuesday morning to become compliant with new legislation. We do not anticipate problems but will proceed with permitting process. Commissioner Farris – 1. Is there a water problem, there seems to be a lot of chlorine in water at my house? Rich stated, I will check on it tomorrow. ADJOURNMENT WAS HAD ON A MOTION Vice-Mayor Fairbanks seconded by Commissioner Mai. Motion carried by unanimous VOTE, meeting Adjourned at 5:40 p.m.